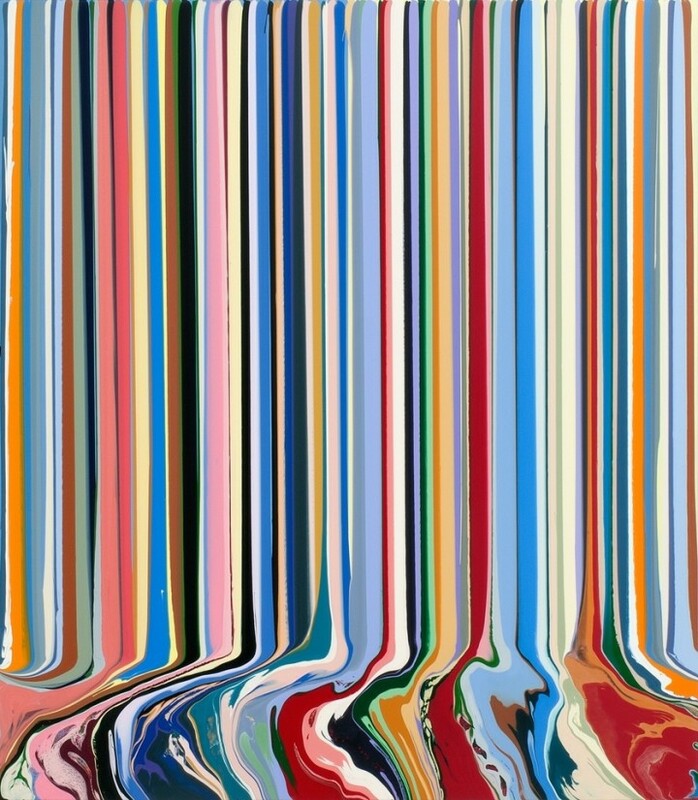 Paul Kasmin Gallery is pleased to present Doubletake, an exhibition of new paintings by Ian Davenport, 8 September–22 October, 2016 at 293 Tenth Avenue in New York. This will be his first solo show at the gallery since 2013. Doubletake comprises a selection of new and recent paintings conveying the coloristic essence of old master paintings through his unique and familiar technique: vertical poured acrylic paint on aluminum-panel-mounted stainless steel, known as his puddle paintings. Ian Davenport’s abstract artwork reflects an ongoing preoccupation with the materiality of paint and the process of painting, but at the same time is he able to convey a subliminal equivalent of the original source, in an homage to the old masters. The palette in each of the new paintings on view is inspired by a particular canonical work of art. The subliminal effect can be seen clearly in (title tbd), referencing “The Church in Auvers-sur-Oise, View from the Chevet”, 1890 by Vincent Van Gogh with the rich blues of the sky, the beige and greens from the lawn and path, and the reds from the roof of the structure. Other referenced works include paintings by Perugino, as well as “Mada Primavesi” 1912, by Gustav Klimt, and “The Marriage of the Virgin” 1504, by Raffael Sanzio. Davenport uses the colors as a reference point to initiate his own color sequences and explorations of movement, surface and light. In his new body of work, Davenport questions how different chromatic weights can occupy a background, as well as the vertical rhythm achieved by compressing and interweaving colors of various widths. By using a large syringe to drip acrylic paint onto aluminum and stainless steel panels, Davenport creates his celebrated studies of color with precision and elegance.